Here is a method to figure out the roll dimension manually. Obviously, it is easier if you use a computer to draw and measure the distance. Many times, however, you cannot use a computer, don’t know how, or just don’t want to rely on a CAD program. This method takes a while to get used to, but once you use it a few times the process becomes much easier. In any case, it is deadly accurate. A sturdy, reliable set-up is essential, and good toolmaking practices are assumed. Click here for a tutorial on how to figure out roll dimensions manually. Injection mold makers, tool designers, aerospace machinists, tool-and-die-makers and precision machinists all use roll dimensions to inspect angles. Mold shut-offs, core pin details, slide angles, lock blocks, tapered pins and interlocks are prime examples of when it is advisable to use roll dimensions. 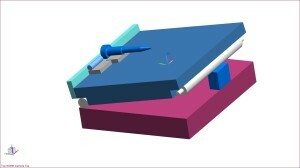 It is essential to understand how to generate roll dimensions manually, but it is time consuming. The desktop app called the Roll Dimension Calculator takes a few pieces of information and instantly calculates the roll dimension you need.